‘Tech for peace’ is a phrase that represents a common misperception at the heart of peacetech: the techno-utopian ideal that more technology will inevitably lead to peace, along a clear, cell-phone lined road. 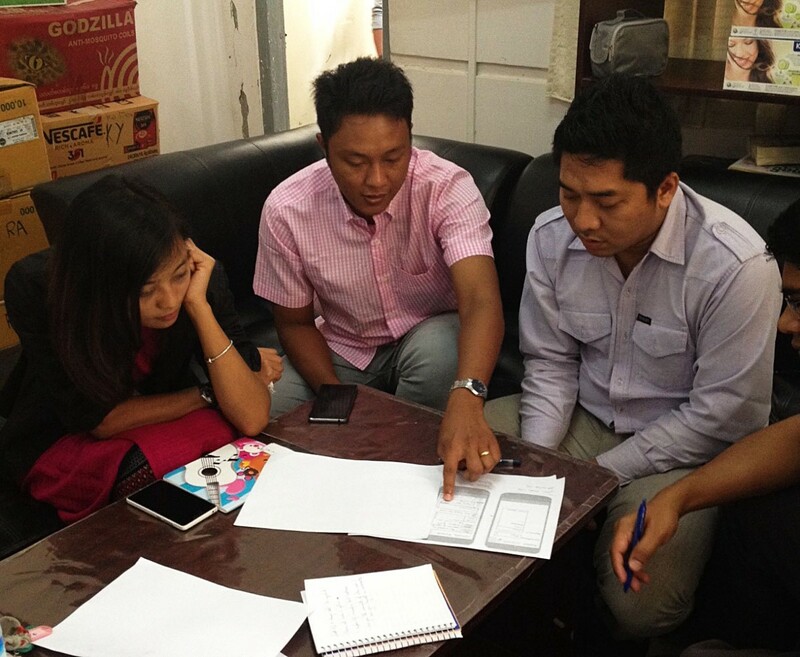 External observers of the peacetech field tend to focus disproportionately on the technology tools used in projects. However, as 2016 Build Peace Fellows, we learned that the effective design, implementation and piloting of peacetech initiatives goes far beyond the technology. We learned that success is defined by participation. Build Peace Fellows at the Build Peace 2016 #peacehack in Zürich. Before starting the fellowship, the three of us had very little technical background, and little experience with user-centered design processes. Through the fellowship, we learned to navigate technical issues, and we gained hands-on experience with the complex challenges of a participatory process. Technology in a bubble is rarely a success. The fellowship programme has demonstrated to all of us that technology solutions require so much more than a slick design, a simple platform and a cool product. They require an inordinate amount of the most low-tech element of all: human interaction — from designing with users at the center, to testing, iterating and refining a prototype, we need to be there with the users at every step. Myanmar’s rapidly expanding technology market is coupled with scepticism of new technologies and concerns over data privacy. 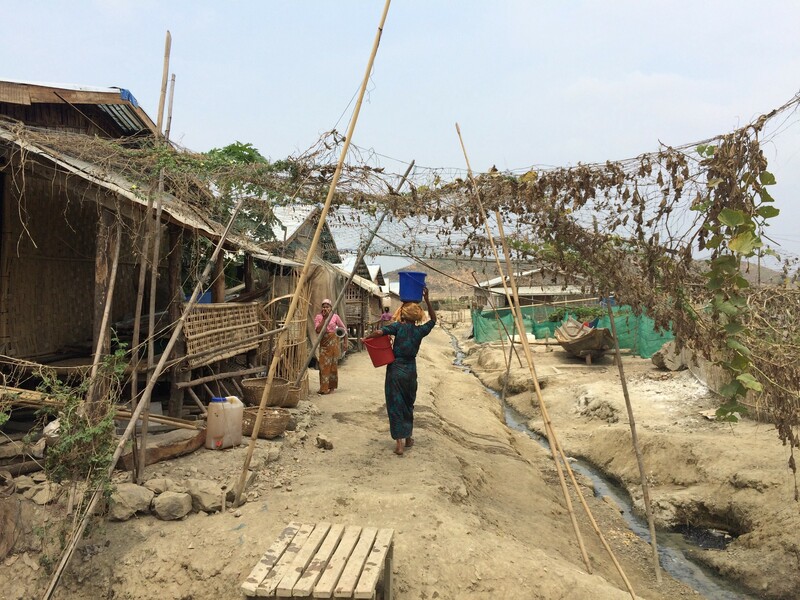 When developing an app to track rumours about communal conflict in Myanmar, building in-person trust to navigate highly sensitive issues was the crucial ingredient in building a tech intervention. By designing with a local network of rumour monitors that already had existing relationships with the partner organization, CDNH, the trust barrier was partially mitigated. 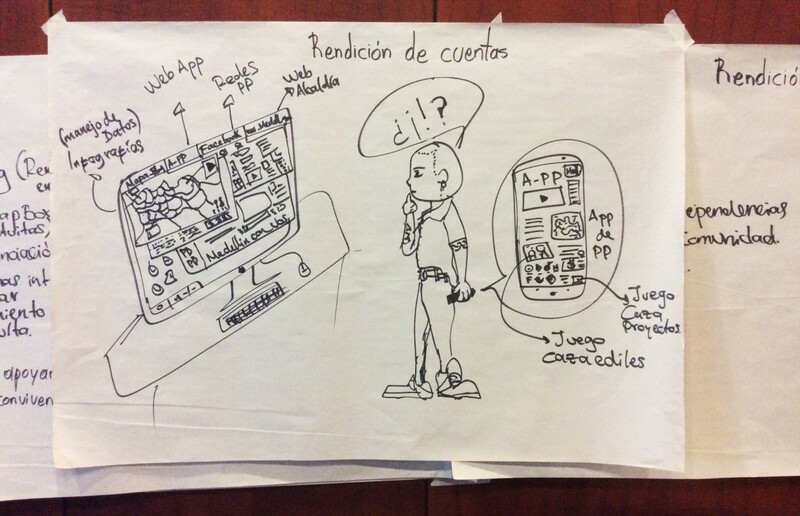 Ideas for tech tools from a participatory design workshop in Medellín, Colombia. However, the need for human interaction doesn’t stop at the first stage. In Colombia, we’re creating a tech tool to support participatory planning and budgeting at the local level. This planning and budgeting process is at the core of the peace agreements recently signed between the Colombian Government and Farc guerrilla, the beginning of a long term reconciliation effort. It has been imperative for us to work collaboratively with our partners to find innovative ways for the project to endure with the users over the many years it takes to build a sustainable peace, bearing in mind that technology is only a small part of a broader online-offline strategy of peacebuilding. The success of a technology tool is often judged on whether it functions as a tech tool in itself, yet how that tool interacts with the broader peacebuilding environment is rarely considered. We’ve learned that for all its complexities, managing the tech tool was the easy part, and accompanying users, addressing their technical and ethical concerns, reaching out to them for feedback and updating them on progress is much harder. Observers often see technology as having the potential to replace human interaction. Yet, as we learned in Myanmar and Colombia, the best tool complements existing human interactions, makes them more fruitful, more meaningful and, ultimately, more peaceful. For the peacetech intervention to lead to change and action, we learned that we needed a thorough stakeholder engagement approach, with bespoke strategies to engage each stakeholder and foster their feeling of ownership in the process. These strategies depend on the stakeholders’ interests. For those with high-level power and with indirect interest, consulting them for advice and learning from their experience can be beneficial. However, those who have less power, but direct interest, often need to be informed and encouraged to join the process. In Burundi, while designing a participatory analysis platform for quantitative data in collaboration with CENAP, one way we involved stakeholders was by inviting them to a formal framework of managed working sessions. There, they could contribute and take ownership over the process. After participating in a number of working sessions together, they felt at ease contributing to the development of the platform. When mapping various stakeholders, it’s easy to leave out those who are next to us: our colleagues. They usually have direct interest in both the tools and processes, and they are critical to determining the project’s success. Sometimes they may seem reluctant, or obstructionist — some of them may have a fear of technology or just lack experience in using it. But they’re also deeply knowledgeable. It’s our colleagues who are most likely to ask appropriate questions about the tool’s relevance and how it fits in the context. 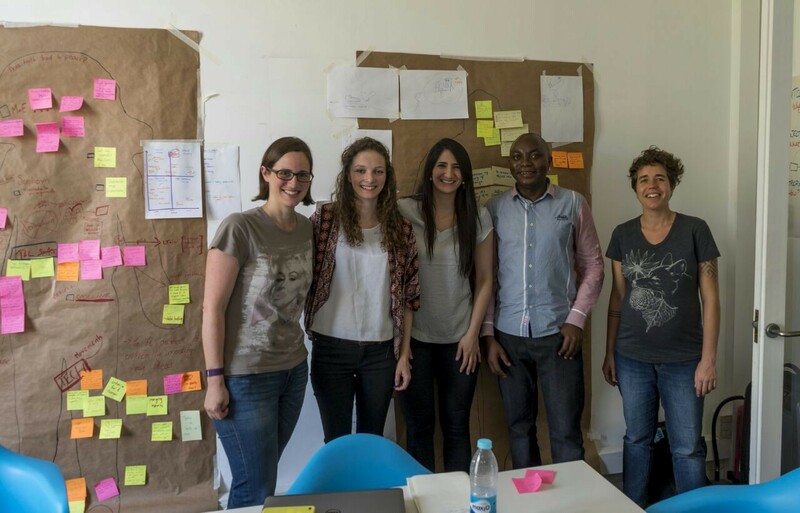 For instance, during the design of the participatory analysis tool in Burundi, we realized that it was important to think about strategies to mobilize the whole team at CENAP to introduce a new way of achieving our goals. Designing with them, testing the prototype with them — even before engaging other stakeholders — helped to mitigate their fears and uncertainties toward technology. It led to more impactful and appropriate results, and got the team fully involved. Peacebuilding is a process. Although we all have high hopes and expectations for the impact of our projects, we’ve learned along the way that peace cannot be forced. Wars and conflicts that have lasted decades cannot be solved with one tech tool in a one-year-program, no matter how amazing it is. One of the biggest insights fostered by the fellowship is the pivotal importance of developing a sustainability strategy. For peacetech interventions to work, along with a thorough offline-online approach and a broad stakeholder engagement, it is critical to develop a plan to secure the project’s impact in the mid- and long term, after the pilot finishes, and beyond the involvement of its initiators. A sustainability strategy should not be left for the last mile of the project, when the funds and time are running out. The best plans for endurance are the ones developed at the beginning of a project. Plans change, and it’s key to be flexible and adaptable as opportunities arise, but there are important decisions at the beginning of a process that might be difficult to amend down the road. It’s important to keep in mind the big picture of the intervention’s long-term goals, which guide everything, from your choices of partners and technologies to even the name of the project. Although attaining a big and fast growth soon after having a workable product might seem appealing, scaling up peacetech interventions needs cold-minded thinking and care. What may have worked at a small scale might not be as stable in a larger implementation, or may need a revisited offline strategy. As we stated earlier, truly impactful peacetech interventions need trust — something only built with time and results. Sustainable growth is an organic maturing process that allows a project to really flourish. Prosperous endeavors are ones that surpass individual ownership and acquire a life of their own. We’ve all put huge amounts of work into these projects, and we feel deeply attached to them and their outcomes. But we won’t be around forever! We’ll need to move on to other work. Part of a comprehensive sustainability strategy is articulating an understanding of how the project could thrive and scale within the host organization and its broader network. It takes a sense of detachment and distance that is not always easy to develop, but it is a low price to pay for the reward of collective ownership. We all entered into this adventure thinking that we were just going to design and pilot a tech tool, but ended up with much more: An amazing life-changing experience and mindset about the central role of inclusive participatory processes to foster peace outcomes. It was not easy to learn and manage at first, but thanks to the outstanding support of our mentors and all the Build Up team, and staying flexible and patient, we embraced user-centred design and empathy as key tools and best practices in tackling the challenges along the way. Discussions about the role of technology in building peace are deepening. Peacebuilders are discovering how to use technology for social good in ethical and responsible, context-sensitive ways. We’re deeply thankful for the opportunity to be part of this much-needed learning process. We’re excited for you to join the dialogue as a Build Peace Fellow, or at the 2017 Build Peace Conference!